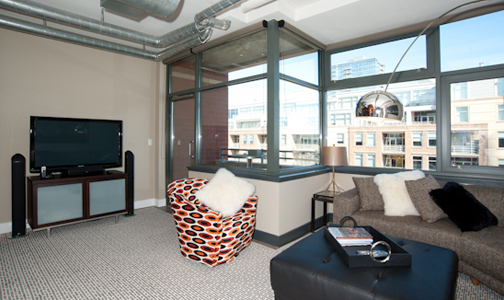 Promenade Lofts #501, Must See! Unbelievably beautiful, this immaculate two bedroom is a city lover’s paradise. Centrally located between LoDo with its many shopping and dining experiences and the Platte River, Commons Park, and Cherry Creek Bike Trail for your recreation pleasures. No expense spared in transforming this home into an urban oasis – luxurious baths with upgraded glass tile, granite counters, and shower doors as well as custom lighting throughout the loft enhancing the space. The bright kitchen features a large breakfast bar, stainless steel appliances, and lots of maple cabinets enhancing the light and comfortable feel of the space. A large balcony overlooks the Plaza and has views of downtown Denver. Promeande #501 has one assigned parking space and one storage unit.